In the midst of her winning bid for Secretary of State, Rhode Island’s Nellie Gorbea stumbled upon an artifact from her childhood. It was a construction paper button from her first-ever campaign, in which a teenage Gorbea rallied to become her school’s Student Council Treasurer. Government, it’s safe to say, grabbed hold of her early. 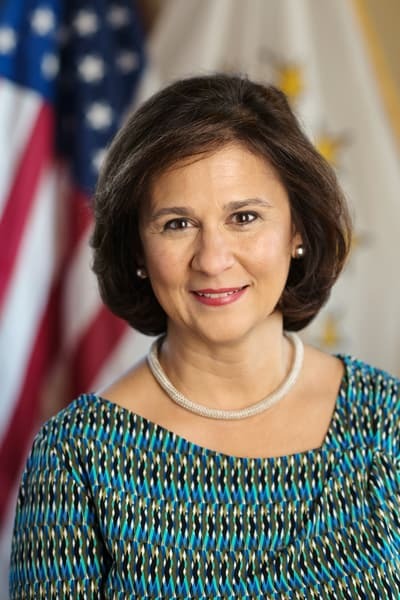 A good thing, too, because in 2015 Gorbea was sworn in as Rhode Island’s Secretary of State, making her the first Hispanic elected to statewide office in New England. Since taking office, she’s wasted little time carrying out her campaign promises, specifically in the realms of voting, transparency, and civic engagement. Not only has Gorbea secured state-of-the-art voting machines for her state, she’s also passed automatic and online voter registration initiatives for the state’s residents, which has showed a marked increase in civic engagement. Gorbea has also worked to crack down on lobbying violations, and sought to make life easier for small business owners via an in-the-works business portal. In an interview with The Alumni Society, Gorbea talks about the successes, the challenges, and why she’s such a proponent for inclusive democracy. What led you to becoming Deputy Secretary of State in 2002? I was president, at the time, of the Rhode Island Latino Political Action Committee, which has been really important in the growth of Latino-elected and appointed officials in Rhode Island. We endorsed a number of candidates in the primary and some of them made it into the general, and I was asked to interview for the administrations of three of the ones that won. The position I chose was Deputy Secretary of State for Matt Brown, who was progressive and had a passion for civic engagement like I did. What challenges would you say you’ve faced throughout your political career? How did you overcome them? When you’re a woman with small children, the challenge is in how you choose to balance your life. How do you create a different path for yourself, because men in these roles can manage work/life balance in a very different way. For many elected women who also happen to be moms, the structure doesn’t work. To go to an event every single night just doesn’t work. You have to set boundaries and design structures to meet with those groups so that they know that it’s not that you don’t care, but that you have this other life that you want to be a part of as well. You’ve taken some big steps forward in terms of voting, lobbying, and election fairness. Why was this issue of such importance to you? At the core of why I ran for office is that I believe the government should work for people. That’s what sets the US democracy apart, and it has not always been the case. Several of the policies that I’ve been able to implement and build have been to help us get to that more inclusive democracy that I believe is what can make our country really strong. Why is reliable voting equipment still such a rarity in the US? Well, the equipment is expensive and it’s not used every day. So, when you have other demands on your plate, it makes it hard to set up the money for it. In Rhode Island, I was able to make the case that our machines were very close to failing—they were twenty years old—and that that was going do a lot of damage to our state. What can you tell me about the business portal you’re helping to develop? The business portal is still a work-in-progress, but that’s one of the areas that I hope in the next four years to really focus resources on. Basically, the business portal allows a person who is interested in starting a business in Rhode Island to navigate through a series of questions that, based on their answers, provide them with the list of agencies, permits, and fees they need to get started. On our side, it’s opened our eyes as to how much small business have to do in the early stages. So I think one of the more interesting opportunities is to use this program to hopefully reduce the demands on small business owners. Of the numerous successes you’ve had in office, what stands out to you as one of your most satisfying accomplishments? It’s hard to name just one—that would be like being asked to pick the favorite of my children—but, over the past three and half years, I really feel that the Department of State shows Rhode Islanders every day that government can work for people. At a time when people have lost so much faith in their government, it’s important for us to show we’re here for you. We work for you. Because of that lack of faith in government, do you think that younger people are taking more of an interest in pursuing politics? To be quite honest, I haven’t seen it on the ground yet. Although, I was speaking with our summer interns, and I am hopeful that all of the energy that has been put into marches and activism finds its way to where it really matters, which is the ballot box. What advice do you have for Latinas interested in pursuing politics? Are there any particular organizations or efforts that can help introduce interested parties? My biggest piece of advice is to not worry so much and just say yes. There is no one path or right way. There’s no secret password to getting elected. You just have to own your own path and do your due diligence. My particular path included serving on the board of directors for various nonprofits, as well as on commissions that were public. I learned a lot. I learned a lot about alternative routes and ways of doing things. I also would emphasize that you can’t be afraid of asking for help. I ask for help every day. Some of us have this mistaken notion that we can’t have for help, that it’ll show weakness. But I’m asking for help every single day. For me, it’s the question of how we make democracy more inclusive. That’s really important because by making democracy more inclusive, we’ll be able to find solutions that are not on the table now. That would address things that I care deeply about, like income inequality or the safety net for people who need it or creating a space for the private sector to thrive. But, in order to get to all those goals, we have to have a decision-making process for a community that is inclusive, right?